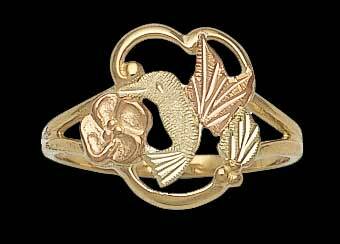 Hummingbird ring in Black Hills Gold by Landstrom's. Leaf accents are 12 karat gold, and grape accents and ring shank are 10 karat gold. Check out our matching Black Hills Gold Hummingbird Earrings and Hummingbird Pendant.